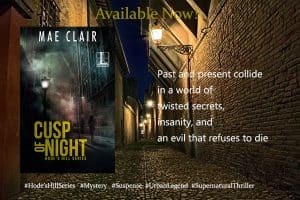 I have the honor to introduce you to Mae Clair – From the Pen of Mae Clair and in her own words: I’m an author who writes mysteries and suspense with a smidgen of romance and elements of urban legend or myth. Many thanks to Esme for inviting me to share my newest release, Cusp of Night. Since this is a cooking blog, I’d also like to share a recipe. I should probably preface that by saying it’s taken me years to become a halfway decent cook. I’m never going to win awards, but after numerous failures, I’ve learned my way around the kitchen. I grew up in a family were the Italian tradition of gathering around the dinner table – whether for an evening meal, holidays, or impromptu gatherings – was honored. My grandfather owned a bakery, then later a restaurant/bar. With that heritage, you’d think cooking would be in my blood. No so. Mix a healthy dose of delusions with 1 cup of vigorous pep-talk. Remind yourself you’ve created complex characters and plots. How difficult can an oven/stove thingie be? Ignore spouse who reminds you about the “infamous cake fiasco” that resulted in one overly large, hockey puck-like biscotti. Apparently, there is a legitimate reason a box cake mix calls for water. Who knew? Settle for making a simple appetizer and breathe a sigh of relief. Ignore husband when he comments the last appetizer you made should have been killed before it multiplied. Blow the dust off cookbooks and search for an appetizer recipe. Turn deaf ear to the husband who suggests you have yet to outgrow the adult supervision stage. Decide you’d rather spend your time writing than crushing tortilla chips and slicing up fat black olives. Celebrate with a glass of wine. Head for your nearest gourmet deli and clean them out of tortellini salad. For the highly skilled (I wouldn’t suggest something this complex on the first try): place tortellini salad in a festive bowl and pass off as your own. Blank expressions and stammering rarely work when someone asks for the recipe. The best you can hope for is a diversion. Fainting usually does the trick. Now that we have that unpleasantness out of the way, 😊, I hope to whet your reading appetite with Cusp of Night. 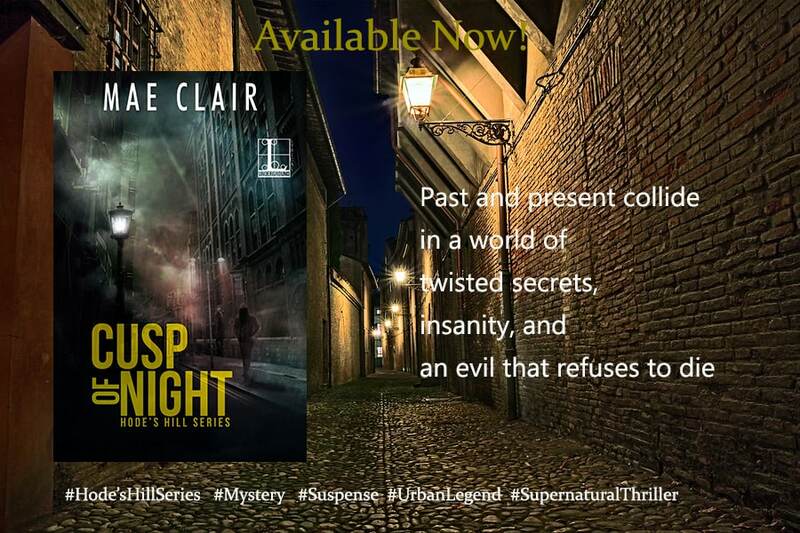 A recipe of mystery and suspense seasoned with elements of the supernatural and urban legend, Cusp of Night is the first novel in my new Hode’s Hill series. It can also be read as a standalone with a definitive ending. BLURBRecently settled in Hode’s Hill, Pennsylvania, Maya Sinclair is enthralled by the town’s folklore, especially the legend about a centuries-old monster. A devil-like creature with uncanny abilities responsible for several horrific murders, the Fiend has evolved into the stuff of urban myth. But the past lives again when Maya witnesses an assault during the annual “Fiend Fest.” The victim is developer Leland Hode, patriarch of the town’s most powerful family, and he was attacked by someone dressed like the Fiend. Thanks again to Esme for being such a wonderful host. Cooking or Cusp, I’d love to hear your thoughts in the comments! I truly appreciate it, Esme! Love the salad recipe and the book sounds delicious. Thanks for hosting Mae, Esme. Glad to meet another friend and blogger – welcome John. John, would you like to be hosted here as well? Please let me know, as I will be honored to do so. Number 8 is hilarious! I can cook, but I’ll never turn down a glass of wine. Great post! I was worried you might de-friend me (joking) after seeing what a pathetic cook I am. I honestly have gotten a lot better, but–wow–those early days! My husband was a saint for eating some of the things I cooked LOL. There’s always cause for some celebration with a glass of wine! Thanks for supporting me on the tour, Staci, You’ve been awesome, and I’m thrilled to introduce you to Esme’s blog! Hi Staci, thank you for popping in and your kind words. I am so glad to see all these new faces visiting and getting to know you all. WIll you do a Guest Post and also share your stories with us? Your recipe had me cracking up Mae:) Great post! Hello Linda – Glad to meet another new friend of Mae. Thanks for visiting! Yes, I have to ask you as well if you would be interested and likely to share a post with us. Denise, sorry I got so carried away with all these lovely people visiting and reading Mae’s post, that I inadvertently added my response to Linda also below your comment. Please accept my apologies. Thank you for visiting here and so glad to meet you as well. 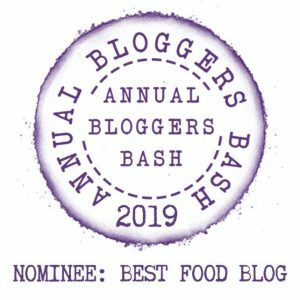 How about you also participate and share a Guest Post??? Number 10 on your recipe list usually works for me. Having fun following you, Mae. Hi and thanks, Esme! It’s so wonderful I’m not alone with number 10, Linda. It has gotten me through a lot of binds, LOL. I’m glad you’re enjoying my tour. Thanks so much for visiting the stops and commenting. It’s always a pleasure to see you! I can’t wait to read this! I always get excited about a Mae Clair book! YAY!! Hi, Lauralynn! It’s so great to have you drop by and visit me here on Esme’s blog. I hope you enjoy the new book. I really loved writing two mysteries (past and present timelines) at once! Hi Lauralynn – so good to meet you and so happy that so many new bloggers popped over to read about Mae. Yes, I would like to know if you would be interested to do a Guest Post. Would that be something you may consider? I popped over and followed Mae Claire. Thanks great post Esme. Hi, Ellen. Thank you so much for following my blog. I hope you enjoy my posts and look forward to getting to know you! Wow, that’s great that you now follow Mae, glad that you connected. LOL. Made me chuckle out loud. I love to cook and try new recipes, but my two sisters stay as far away from their stoves as possible. Patty even had her stove disconnected from the gas and electricity and uses her oven for storage:) I could relate to your culinary skills:) Lots of fun! OMG, she uses it for storage? Now I don’t feel so bad, LOL. Judi thanks for popping in! I am glad to hear that you love to cook! Using the stove as storage, I must admit that’s a new one for me and made me smile, as its strange to me to think of such a thing, but if you do not cook and you have a stove then storage space it can be, why not. Now, how would you like to share a post with us? Esme, thanks for hosting Mae. Hugs to you both. I’m glad you enjoyed this, Teagan. I had a lot of fun writing it. The cake mix incident really happened and I have yet to live it down. As a friend of mine said “But there are VISUAL GRAPHICS in the directions. How could you miss the water?” Only me, LOL! Hi Teagan, Good to see you again! Hope you’re doing well. As you have already done a Guest Post, how about you do our 20 + 1 Interview Questions? Would that be something that may be of interest to you? Love your recipe, Mae – lol! That recipe seems to fit you so well. Maybe you should release a cookbook too. Hi Diana – so great to see you here again. Thanks for visiting! It’s definitely a fun recipe to try, Diana, LOL. Thanks for popping over to check it out. It was a lot of fun to be Esme’s guest. She’s an excellent host! Just finished Cusp of Night on Monday. Jackpot! Cheers to you! Wonderful to discover your website, Esme. I’m a delighted new follower. Haha! That recipe does makes the rounds, doesn’t it, LOL! I am SO excited to hear you enjoyed Cusp of Night. Thanks so much for sharing and all your support. I’m also glad you had a chance to meet and follow Esme! A very entertaining post, Mae and Esme. Hahaha love the recipe! That one is right down my alley. I also look forward to getting into Mae’s book. All her books have kept me on the edge of my seat. Hi, Flossie. So glad to have you pop in and visit me on Esme’s blog. Isn’t it a great place? Thanks for your kind words about my writing and books. So appreciated! Flossie – may I ask you as well if you would be interested to share your story here with us?? If so, please let me know. Haha!! Esmé, a lovely guest post from Mae! Bless you Mae, you have me in stitches with your recipe…your darling non-helpful husband hovering around! Thank goodness for shops and no one will be the wiser! It’s been great following your blog hop and I’m enjoying learning so much about your research! Wishing you both a great start to the week! Thanks, dear Annika. I just ♥ all you wonderful and creative bloggers. You’re beyond awesome and I look forward to your interview being published. It’s another very good and fantastic one. This is awesome, Mae! *Note to self: Mae’s tortellini can be purchased at a nearby deli so don’t ask for the recipe* 😀 I especially like step 1–that could apply to sooo many things! Great guest spot! Thank you so much for your visit and leaving a note here on Mae’s post. Would you like to do a Guest post with us or even the 20+1 Interview Questions?